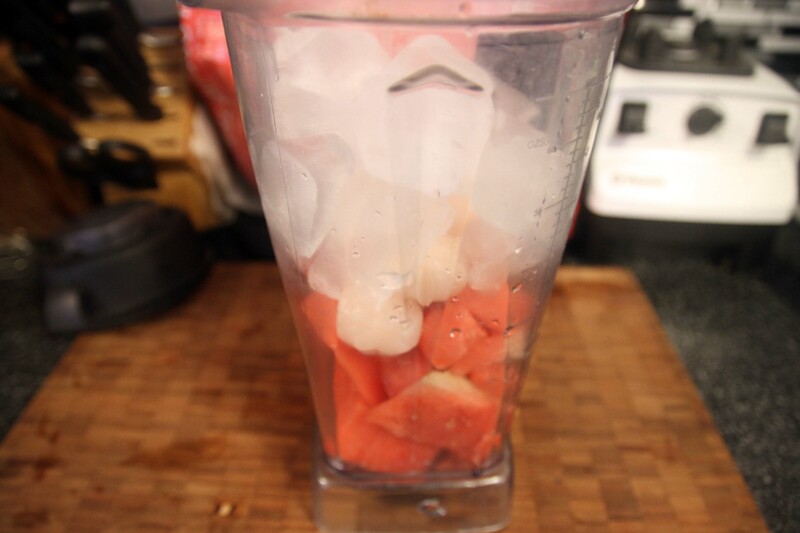 This is a super simple watermelon slush drink that really hits the spot on hot summer days! The name however, is totally wrong — there is no Tea at all in this drink. Also, depending where you go, they call the drink by different names. 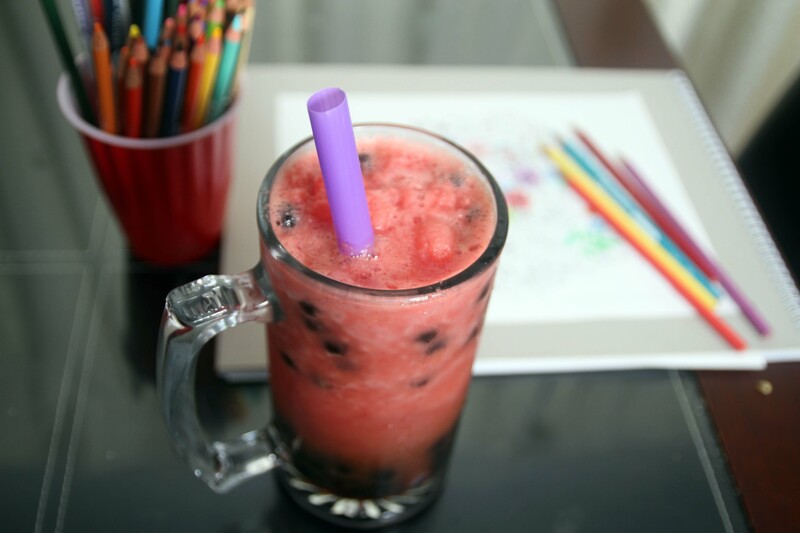 In LA, if you don’t call it Boba, even if you don’t speak a word of Chinese, they know you are not a local. Here in Vancouver, you can call it by anything, and people will understand. 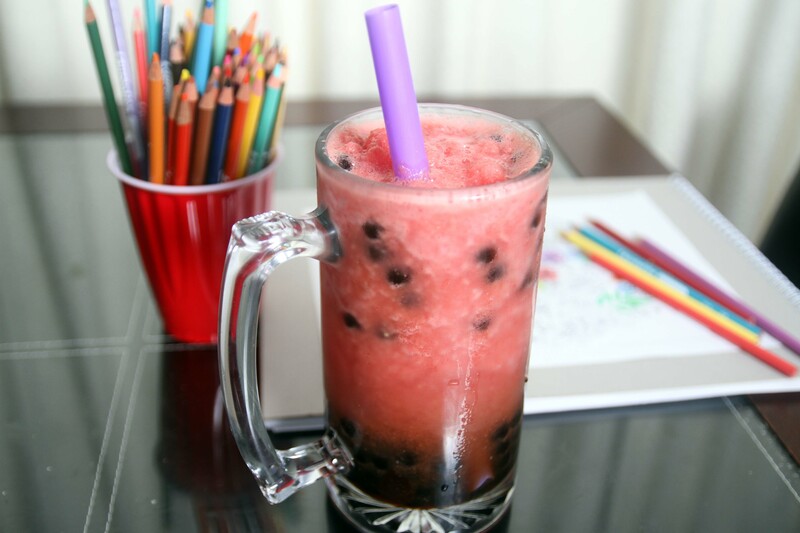 Bubbles, Pearls, Balls, Tapioca, Starch, Boba — it’s all the same thing. The first thing to do is boil a LOT of water. 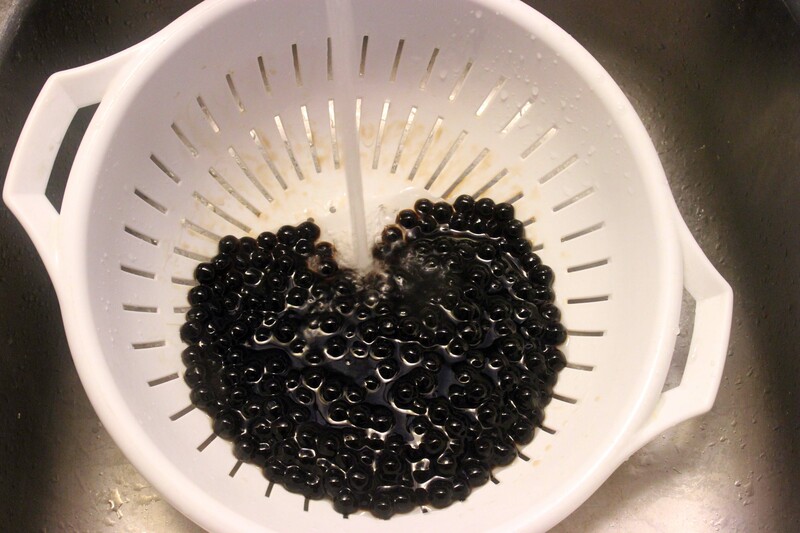 These tapioca pearls soak up quite a bit. 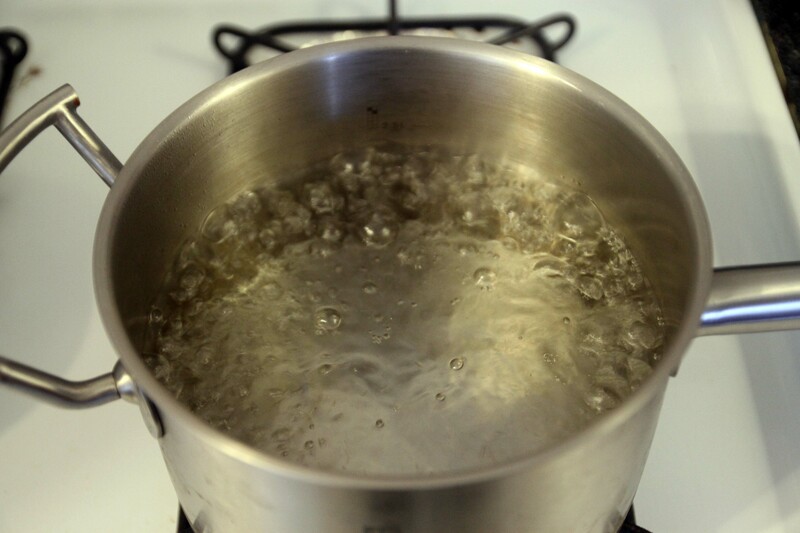 Boil a full 2 litres of water in a large pan. 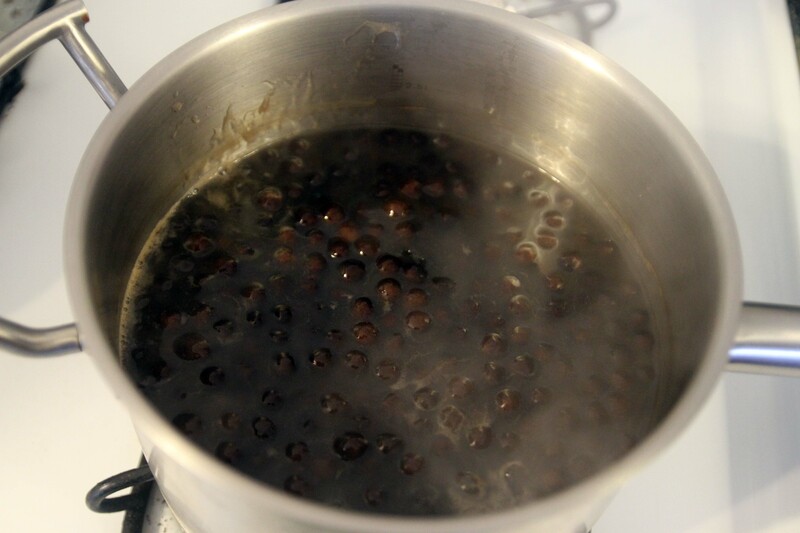 Throw the Tapioca Balls in, and give it a few stirs. Read the directions on the package that you buy — each type have slightly different variations. Generally speaking, boil for a solid 30 mins. Keep giving the pot a stir every now and then to avoid clumping. When the pearls are cooked, turn off the fire, cover the pot, and let it stand for another 20 mins. 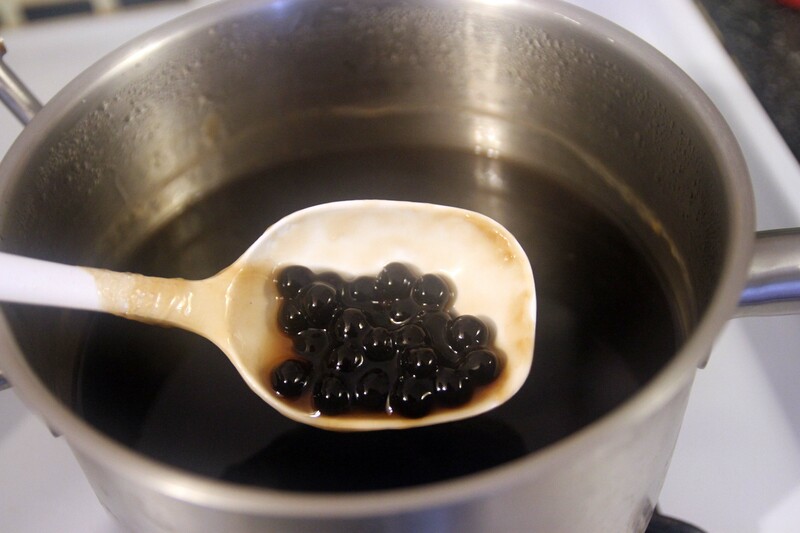 In a much smaller pot, put in 1 cup boiling water, and 1/2 a cup of the Black Sugar. Cane sugar, and Palm Sugar also work really well. You can make this sweeter using white granulated sugar, however I don’t add any. 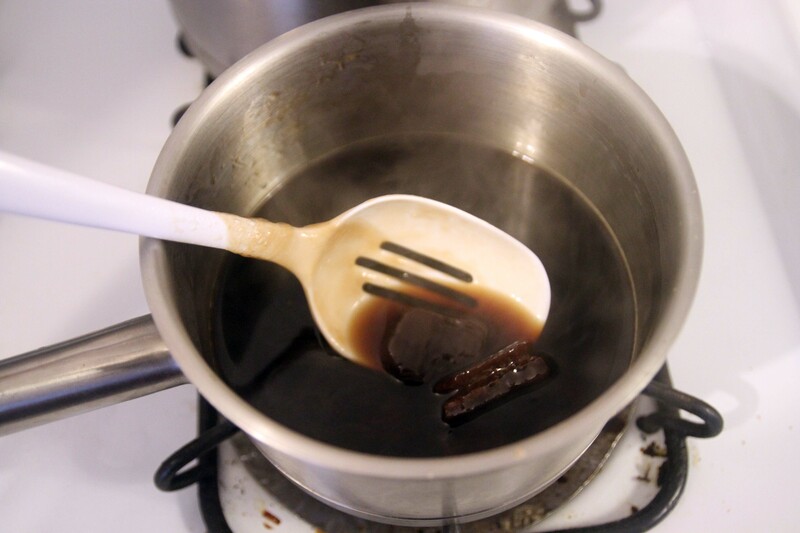 As soon as the water comes back up to a boil, lower the temperature, so that it doesn’t scorch the sugar. 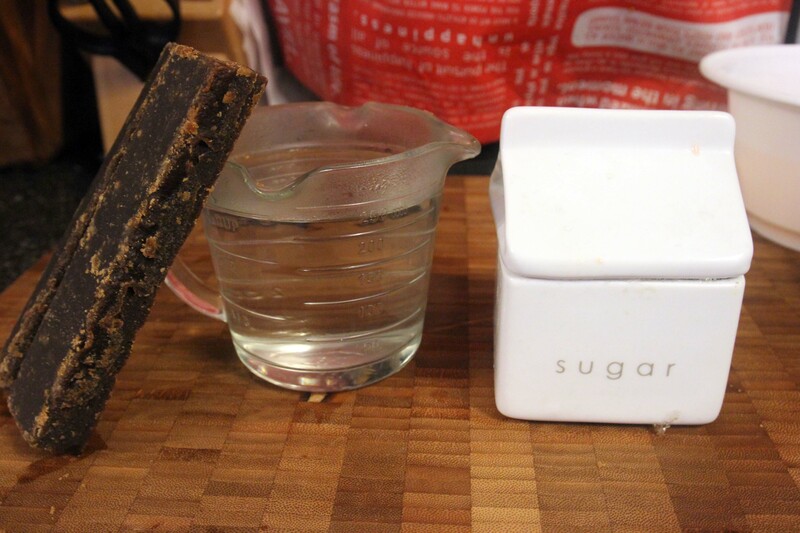 You can turn it off before all of the sugar dissolves, as the heat will hold. Keep stirring until everything becomes completely dissolved. This whole process should take 10-15 mins. Grab the pearls now, and drain all of the water. Rinse them under lukewarm running water. Finally throw them into the pan with the Simple Syrup. These are now ready to be eaten! 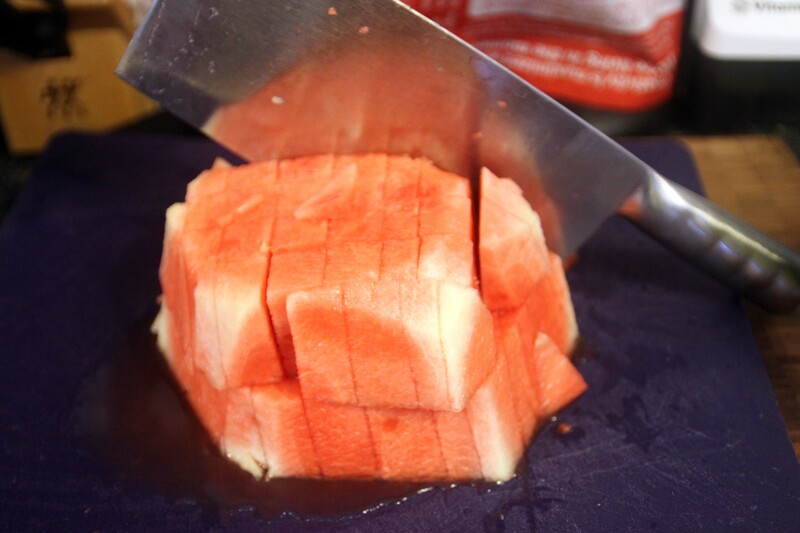 I personally find the easiest way to cut a watermelon is to slice it in half, and then chop off the outer layer edge by edge. An insignificant amount of edible parts are wasted using this method, but the time savings are astronomical. 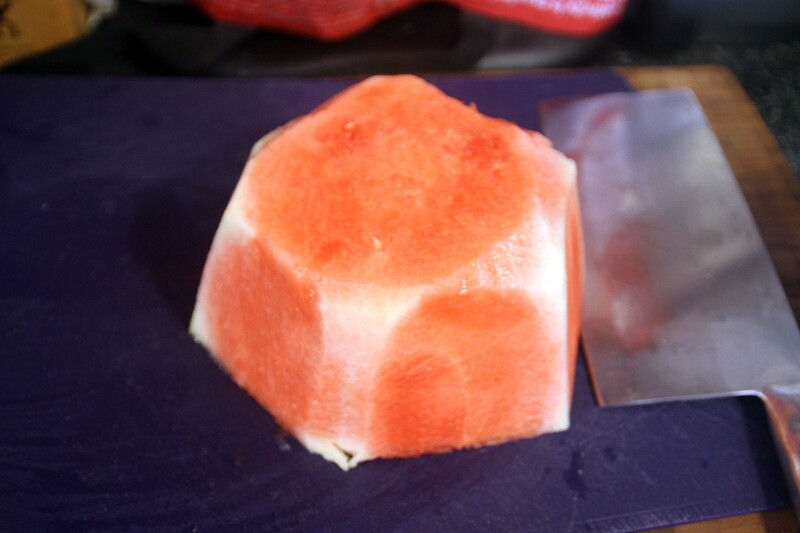 To make things easier for the next time I make juice, I cube the Watermelon, and keep it in a container. Same thing with the Lychee — open up the can and put it in a container, so that it’s handy for the next day. 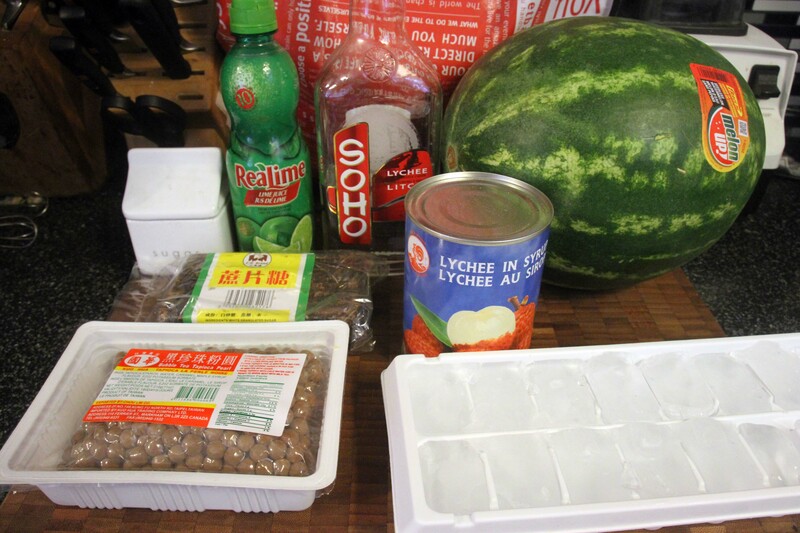 Always making servings for 2, I throw in about 2 cups of Watermelon, 4 Lychee, and 12 Ice Cubes. Dash 2 shakes of the Lime Juice in, and pour some of the liquid from the canned lychee in as well to sweeten things up. Blend the crap outta the mixture! You want it super smooth, and no pulp. Vitamix’s work great for this! Grab a tall glass, throw in a couple spoons of your now fully-ready pearls. Make sure to get some of the simple syrup as well! 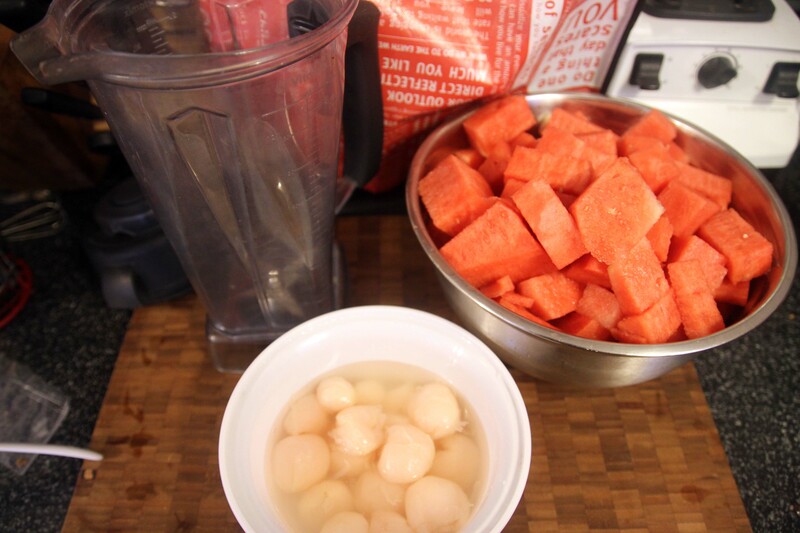 Fill up your glass with the Watermelon Lychee slush, and get ready to add the secret ingredient! Depending on your tolerance, I like a double shot myself 🙂 Just pour it on top, and it will mix in by itself. Ta da! There you have it! 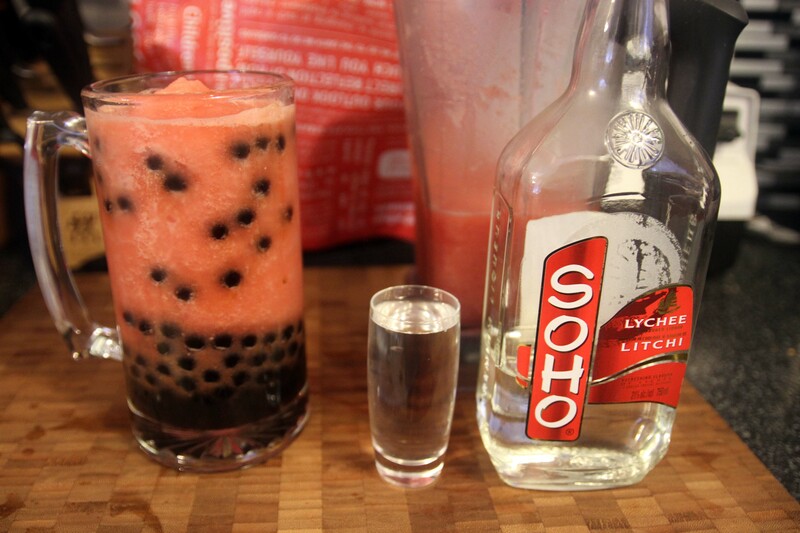 Spiked Watermelon Lychee Bubble Tea! 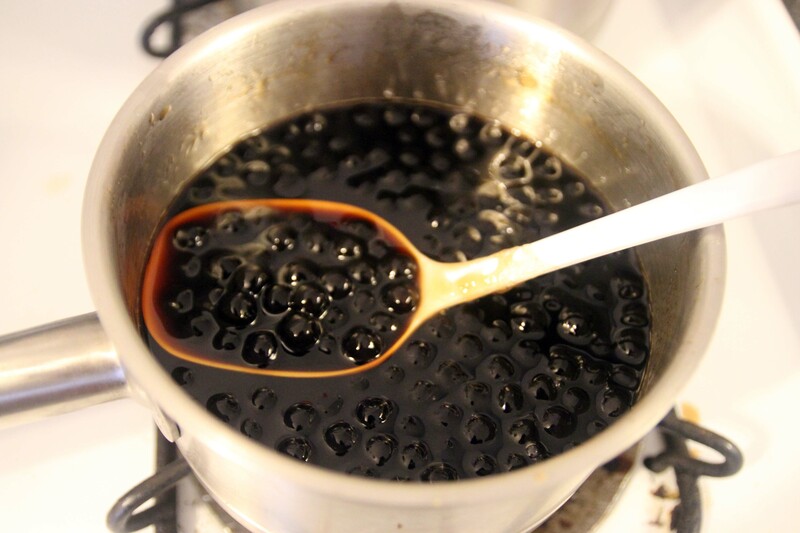 Protip: The tapioca balls last in the fridge for a while. Just heat it up, and the balls will become tender again!